April 20, 2017	by B-Boy Productions, Inc.
Disclaimer: We are not endorsed by Vision DJ Designs. From time to time, we find a product or service we use or feel is extremely worth sharing. Yesterday we blogged about DJ furniture that we had invested in over the previous 2 years. Fast forward to this past March. 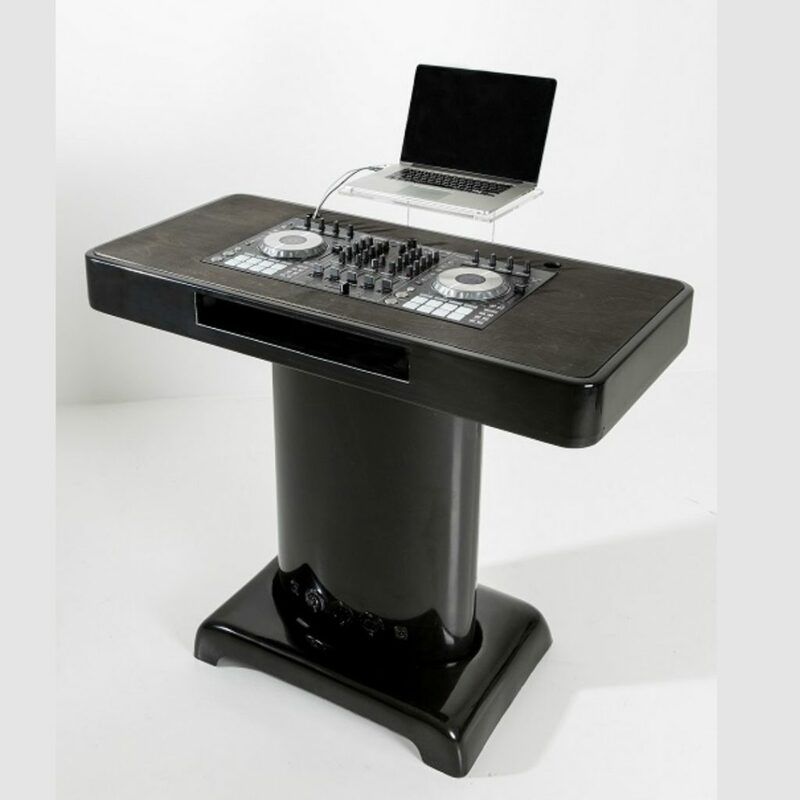 The DJ industry received an early Christmas gift – affordable DJ furniture. Right off the bat, you have to know that Vision DJ Designs has owners that get it. Joe Bunn, one of the co-owners of Vision DJ Designs, has been rising in the ranks of the industry elite and has released many educational products for DJs. This is his first foray into the manufacturing business and this product is rock solid. Joe and and Frank Meldau (the other co-owner of Vision DJ Design) both DJ under Bunn DJ Company out of North Carolina and were tired of DJ’ing on 6 foot skirted banquet tables (sounds familiar). There had to be something better out there…but there wasn’t anything that addressed all their concerns at a reasonable price point. So they built their own and launched DJ Furniture by Vision DJ Designs. In addition to being a DJ, Frank is also a fiberglass expert and has made everything from water slides to giant Christmas balls to sailboats. Joe approached him about making a lightweight, portable, great looking DJ booth, and boom! They did it! 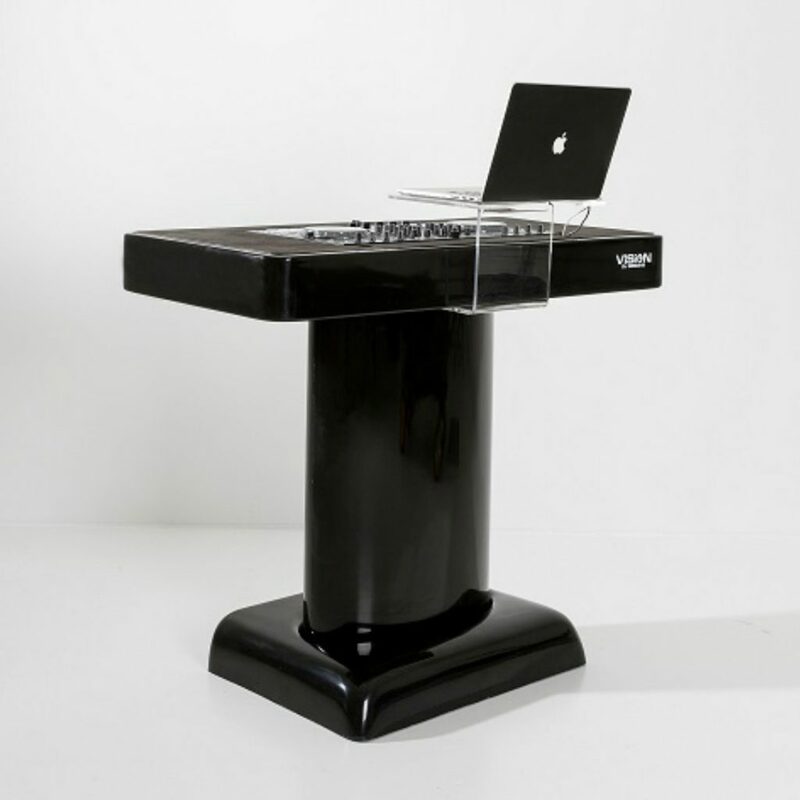 Lightweight and portable: This is essential for selling any piece to the the mass DJ market, let alone DJ furniture. Not everybody has a box truck or trailer or extra staff to transport or set-up. This breaks down and fits in two carrying bags. Total weight of the unit is less than 50 pounds. Upon set-up, there are no tools necessary. Takes 5 minutes and you’re ready to rock (I literally sat there with a stopwatch to time it). Height Specific: One of the things I love about the company is that their product can be sized at the height you want for no additional charge. We have DJs on our team who are over 6 feet tall and some that are at 5 feet or less. That is a huge disparity that hurts the back of the tall ones and has our shorter DJs reaching for knobs or standing on a box if the height isn’t right. This is a huge win for the DJ industry. Black or White Color/Customized Top: An advantage for working with a small manufacturer like Vision DJ Designs is that you can get so many things custom at no charge. Black color not your thing and prefer white? Change it. They’ll do it in either color. What if a new DJ controller with different sizing comes out after you buy this DJ furniture? Order a new top only to fit the new controller. 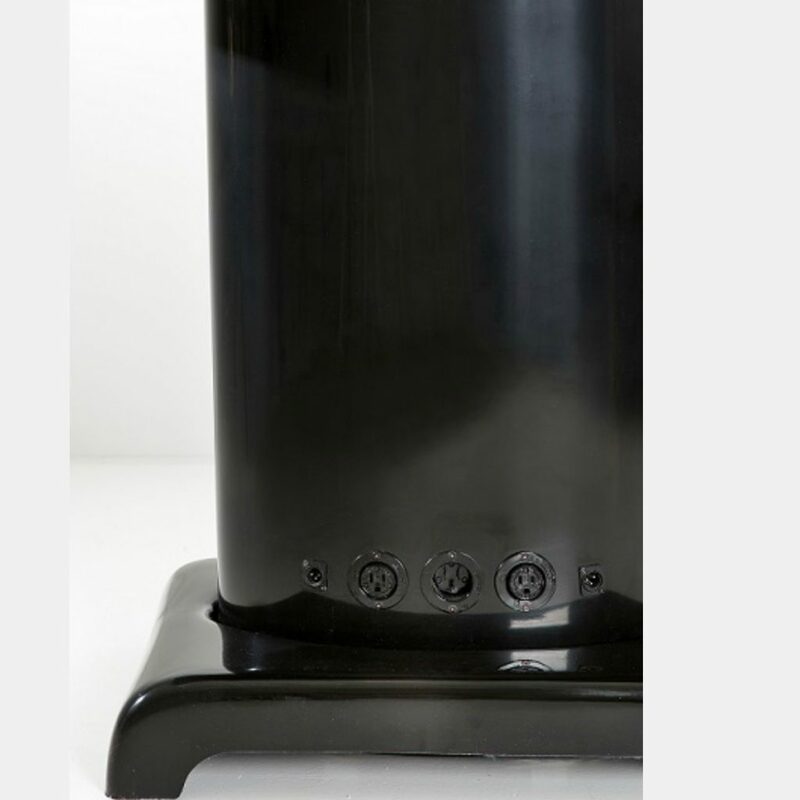 This extends the product life of this furniture piece. All-In-One: The last thing you want to do after spending money on DJ furniture is have cables everywhere. They thought of that too. All the power and speaker XLR plug-ins are hardwired INTO the case. Genius. 4 cables out of the unit from the front (not in view of the guests) eliminates the need to have to dig inside the unit and thread cables through it. See below. Affordability: What good is DJ furniture if you can’t afford it? Out the door, the base price is $999 (no bags). If you get all the bells and whistles (2 carrying bags, pre-wiring and laptop stand), you’re looking at $1899 (and that INCLUDES shipping). This piece is truly unique and will up your game in front of clients, venues, and vendors! It also shows you care – not just about the performance (that has to be priority number one) but that you also care about the aesthetics. This can increase your value instantly. Give it a look over and order yours today. Hi i’m looking for something like this to house 2 denon sc5000m 2 turntables and a mixer all in 1 piece any thoughts? Hi Jay – Contact Vision Designs directly. I believe they can do any configuration you are looking for.